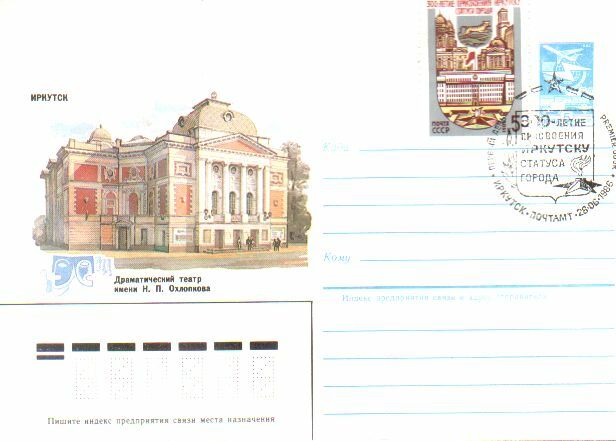 http://stamps.lgg.ru - philately, numismatic, phone cards, catalogues. Mon...№: 57 - All-Union philatelic exhibitio...№: 58 - Museum of a history pre-revolu...№: 59 - The tenth international congre...№: 60 - Hotel "Inturist"
Description: Street K. Marksa, 14. Construction of a building was conducted in 1894-1897 under the project of the academician of architecture of V.A.Shretera. The first performance played on a stage of theatre August, 31, 1897, "Auditor" N.V.Gogolja was. In Irkutsk for the first time in the country N.Leonova's plays "Invasion", K.Simonova " Russian people ", and also a number of products of A.Vampilova were put.